Welcome to the Buckfire & Buckfire, P.C. motorcycle accident library. Here you can find information about Michigan motorcycle accidents, current cases of interest we are involved with, settlement information from cases we have won, and lot of other pertinent motorcycle information. Of course, if you have been involved in a Michigan motorcycle accident, it is important to contact an attorney right away. Call us anytime at (855) 754-2795 to speak with one of our expert motorcycle accident lawyers. "I was riding my Harley Davidson motorcycle when I was rear-ended by an 18-year-old kid on a 'crotch rocket' motorcycle. I called Buckfire & Buckfire and spoke with attorney Bob Lantzy. I was impressed by Bob’s knowledge concerning my type of case and the fact that when I spoke to Bob it was like speaking to a 'real person.' 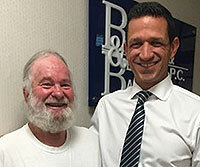 Bob assured me at the outset that my case would not be transferred to any other attorney and that when I called I would speak with him rather than a paralegal or clerk. Bob was true to his word." Attorney Referrals For Michigan Motorcycle Accident Cases - Refer Case (800) 606-1717: Referring attorneys choose Buckfire & Buckfire, P.C. for their motorcycle accident clients in Michigan. Refer your client to our law firm. Referral fees guaranteed. The Michigan Motorcycle Accident Handbook Download our Michigan Motorcycle Accident Handbook written by legal expert and managing partner Lawrence J. Buckfire. Download it for free now! Pain & Suffering Settlement Motorcycle Accident Michigan (800) 606-1717 Pain and suffering settlements from a Michigan motorcycle accident are often significant. Start your case today. No fees unless you settle. Help For Bikers After A Michigan Motorcycle Accident Get help after a Michigan motorcycle accident by top rated biker injury attorney. Waterford Motorcycle Accident Victim Dies From Serious Injuries Michigan motorcycle lawyer filing wrongful death lawsuits discusses rights of Waterford motorcycle accident victim killed in fatal crash. Helmet Use and Motorcycle Accident Injuries | Michigan Biker Injury Attorney Michigan biker injury attorney representing motorcyclists injured discusses motorcycle accident injuries and its relation to helmet use. Michigan Motorcycle Accident Lawyers Discuss When Accidents Happen (800) 606-1717 Michigan motorcycle accident lawyers representing injured bikers discuss when accidents happen. Call now! Common Victims of Michigan Motorcycle Accidents | MI Biker Attorney Michigan Biker attorney representing victims injured and killed in motorcycle accidents reveals most common victims of these crashes.